Most players want to have a lower score but few are willing to spend any extra time on the range, putting green, golf course or working with a teacher. There’s certainly nothing wrong with getting out to play golf with your friends, have lunch, enjoy some frosty beverages and head back home; after all, that’s how most people participate in the game. Other players are more serious and put in extra effort. Still others seriously study all parts of the game with diligence and passion. And then there’s Lucas. 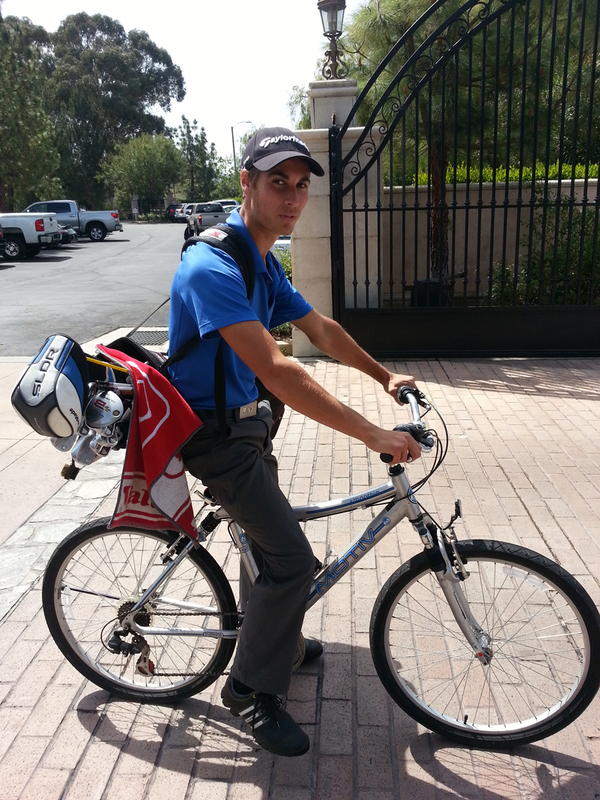 He usually rides his bike to his lesson and sometimes even walks, with his clubs, from TPC to Big V. The best part? He doesn’t even think twice about it. That’s impressive to me but, as he explained, it’s just no big deal. Lucas is from the Netherlands and here for school and golf at College of the Canyons. He tells me that back home almost everybody rides a bike or walks to get somewhere. I could go on and on about our “right now” culture and hurrying here and there all the time and the probable damage created by “having no time.” Hell, I do it myself! There are zillions of ways to get better at golf that ARE NOT very time consuming and can be done at home or in an office. Most of us don’t, can’t, won’t find time for hardly anything, let alone consider riding a bike to the golf course. I mean that’s crazy right? Not to Lucas DeGroof.